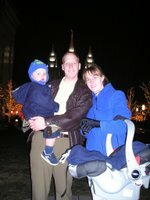 In the twilight of yesteryear...which is to say yesterday at about 10:30 pm--Kristi, our kids, and I found ourselves once again taking a family picture in front of the Salt Lake City LDS Temple amongst the hundreds of thousands of Christmas lights that the LDS Church strings in honor of the season. Try as we might, though, the picture always seems to turn out as unprofessional as they come--this lack of quality itself has nearly become part of the tradition. In the first year, Remi, our oldest, was only a few months old. 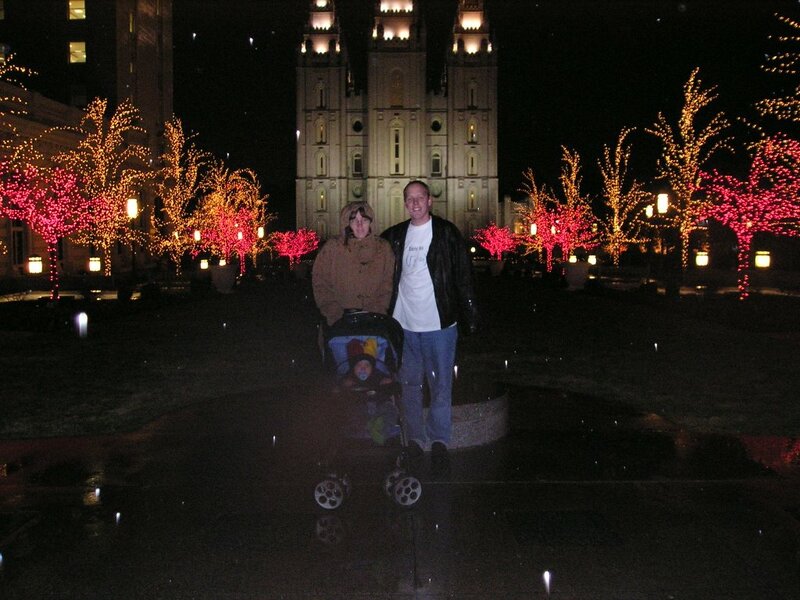 We had been taking pictures of the lights and decided that one with the Temple in the background would be nice. We asked a passerby to do us the favor of pointing and clicking, and she obliged. Sadly, though her kindness is appreciated, she probably should have given the opportunity to someone else since the final product was a crooked, fuzzy mess. We laughed about it and decided that we would try again next year. This time, we brought along a friend that we k new was familiar with a digital camera. Remi was now about 16 months old and there was a second (at this point "unofficially") on the way. 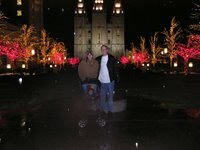 When we arrived at Temple Square, it started raining. A lot. However, this was going to be a tradition of ours...we set out to start some Christmas traditions, and, by golly, this was going to be one of them! Needless to say, despite our friend's proficiency with the digital, there was no overcoming the heavy rain. The picture was straight and crisp...except for all the Heaven-sent water streaking through it. Being New Year's Eve, we, of course, went home immediately afterwards to make sure that we were in time to bang pots and pans, which Remi did with gusto. He stayed up entirely too late--about 2 am, and was up right at his normal time (7:30 am) with enough crankiness to last him for all of 2007. Ah, well, it was fun to ring in the new year as a family.